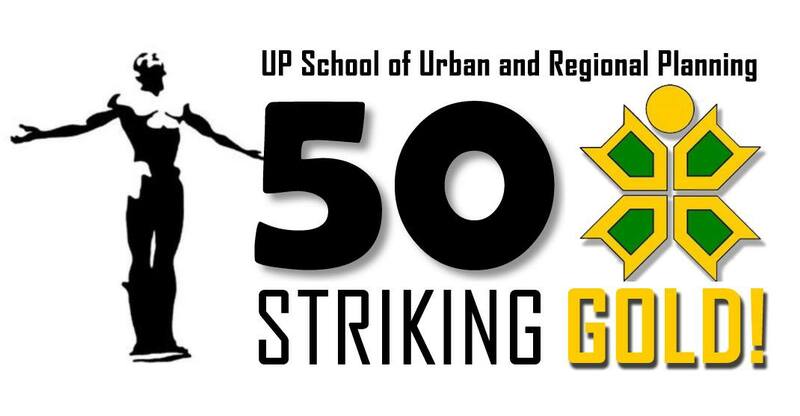 Period for Nomination of UP-SURP Outstanding Alumni Extended! The Search Committee for Outstanding SURP Alumni announces the extension of the deadline for the nomination of Outstanding SURP Alumni. 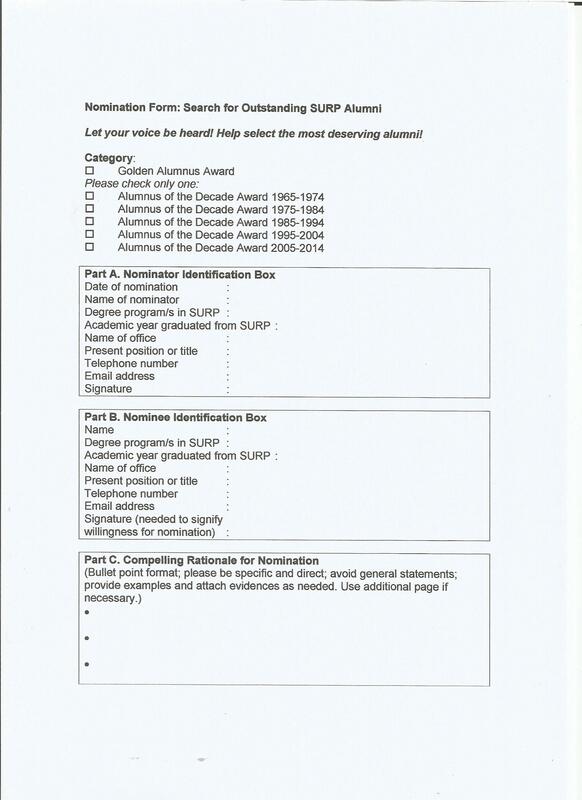 This extension is made to give more opportunities for more alumni to nominate their fellow SURP Graduates. Nominations will be accepted until 12 Noon, 8 October 2015. 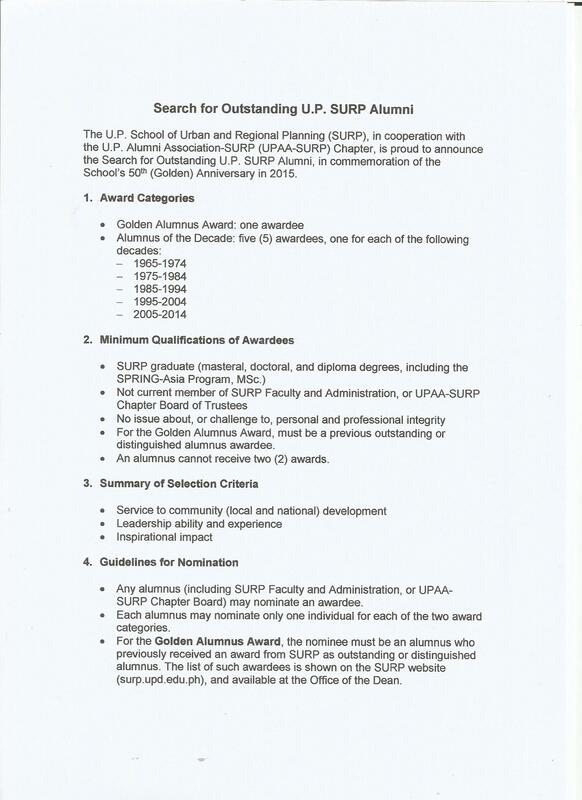 All SURP Alumni are encouraged to submit their nominations. Please refer to the attached guidelines and nomination form for more information. 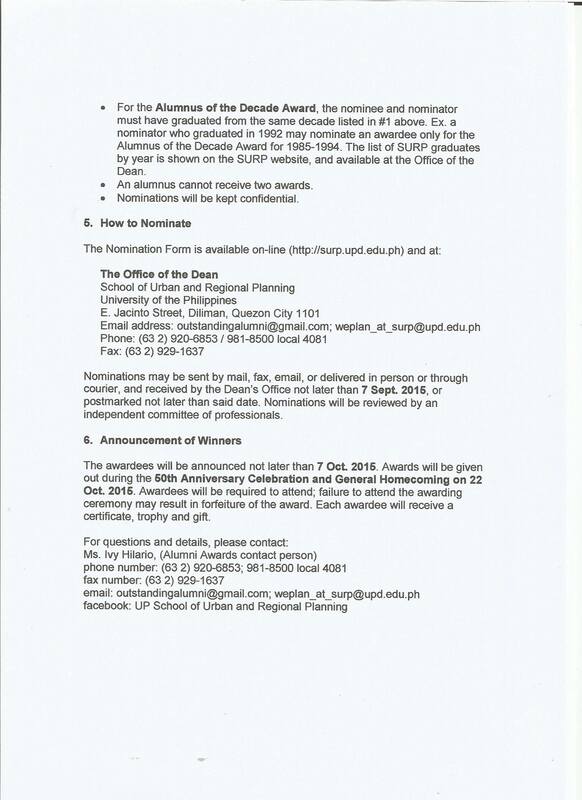 Nominations may be sent to Ms. Ivy D. Hilario (Alumni Awards contact person) at outstandingalumni@gmail.com. SURP will be a center of excellence for learning and research in the development of innovative theories, tools, and sustainable practices in urban, rural, and regional planning adapted to developing countries. Improving the quality of education in the school and producing highly competent planners. Extending technical assistance to government, non-government organizations (NGOs), peoples' organizations (POs), the private sector, and other academic and research institutions on policy formulation and plan preparation for the development of localities, regions, and the nation. Disseminating new knowledge on urban and regional planning theories, tools, and practices through the School’s publications and training programs. 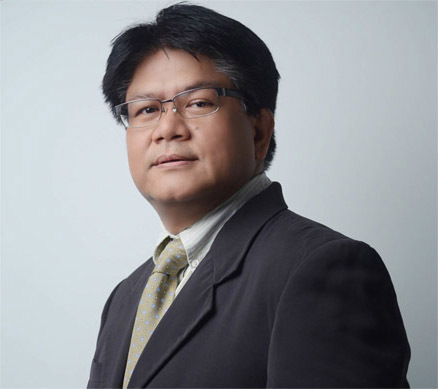 Protecting and advocating for the welfare of society -particularly the poor- and promoting social justice and equity in the formulation of development plans and programs.